Can I do MAX Workouts if I have bad shoulders? I’m not a medical doctor, so I can’t give you a diagnosis or prognosis for any physical conditions or injuries that you may have. You should always seek out a medical professional and get their expert advice regarding your condition or injury to determine if MAX Workouts is right for you. From my experience, whether your shoulder injury prevents you from participating in the program or not, depends on the extent of your injury. MAX Workouts does involve overhead pushing and pulling movements which can irritate an injured shoulder. If you’re able to perform these movements without much pain or discomfort, you should be able to do the program. I also have an extensive list of shoulder rehab exercise videos on the website that you can do to help you strengthen and rehab your shoulders while going through the program. If, however, you cannot perform any overhead pushing or pulling movements without experiencing any pain or discomfort, I would not recommend the program for you at this time. If you're on the fence about MAX Workouts, you're welcome to get a copy and give it a try. Your purchase is backed by my 90 day, no-questions-asked, money back guarantee, so if the program isn't right for you, let me know and I'll be happy to refund your money. Shin Ohtake's unconventional, no-nonsense approach to fitness & fat loss has made him the go-to source for fitness enthusiasts and trainers alike. His world-famous fitness program, MAX Workouts, has transformed and reshaped the bodies of thousands of people in over 100 countries - without requiring hours in the gym. 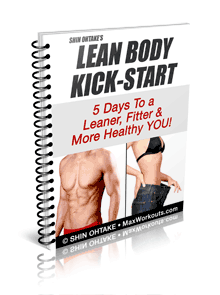 "The Workout & Nutrition Tips in Shin's 5 Day Lean Body Kick-Start Will Show You How To 'Trick' Your Body Into Producing a Flood of Fat-Burning Hormones"
Just fill in the form below and you'll get instant access. I can't wait for you see what I've got in store for you...this is going to save you YEARS of frustration!